The Thera Band FLEXBar is a one-of-a-kind physical therapy tool that treats tennis elbow and increases grip strength and upper arm functions. Flex Bars are portable come in 4 colors, each one corresponds to their tension level. 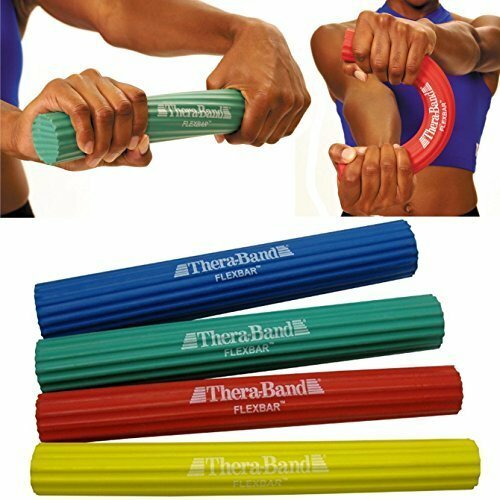 Thera Band bars are 12 inches (one foot) long and easy to hold with a textured grooved surface, made from natural tree rubber and latex. Improve your grip strength and stabilization in your upper extremities with this 12" long bar made from dry natural rubber. 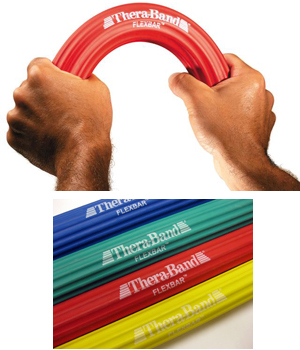 The Thera-Band FlexBar is a flexible, durable resistance device with a ridged surface for enhanced grip during use. Not only will it help your grip and stabilization, it has been research-proven effective for Tennis Elbow. I love this product. And my 85 year old Mom is using it also.